The following information primarily covers locomotives purchased strictly for use on the California Zephyr. D&RGW's initial locomotive purchase for CZ motive power from ALCO was quickly supplemented with an additional order to EMD. This effectively mixed their power pool assigned to the CZ. CB&Q followed later by mixing their E7's and E8's into CZ duty. Only the WP continued to assign locomotives purchased specifically for the CZ until it's demise (although they too had some very rare exceptions!). No attempts will be made to provide exact engine road numbers used beyond those originally ordered for Zephyr service. This is due to the extreme diversity of engines used on the California Zephyr, especially during it's later years. Other examples of motive power used on the California Zephyr may be seen on the Gallery page. 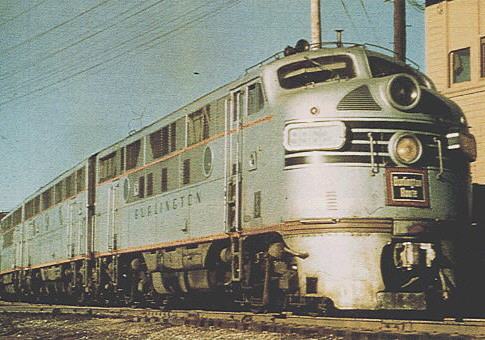 Chicago, Burlington & Quincy's initial locomotive purchase for the California Zephyr consisted of three A+B+A locomotive sets of F-3's from GM's Electro-Motive Division. 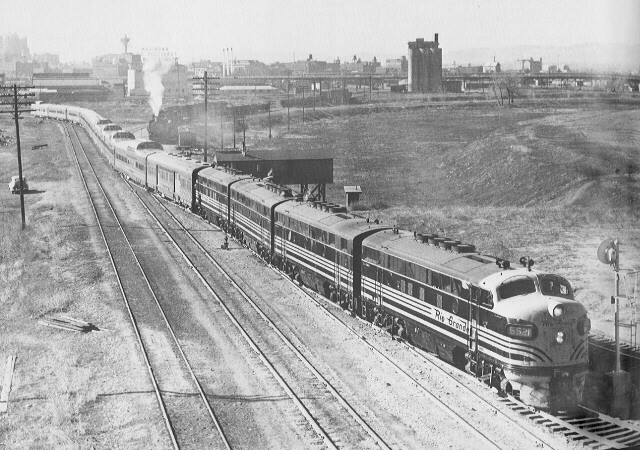 Although they were supplemented by EMD E-5's, E-7's and E-8's in the early 1950's, they remained in Zephyr service until 1955 when they were re-geared for freight service and had their steam generators removed. 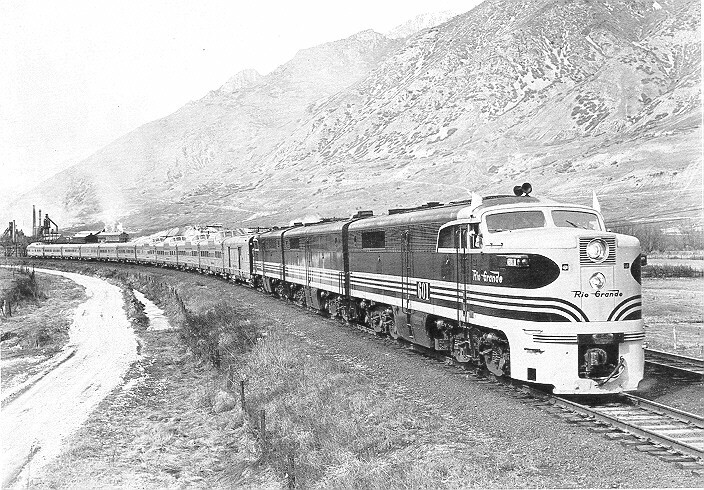 At that time CB&Q's E unit fleet was well enough equipped to provide full service to the California Zephyr. After the F-3's removal from passenger service the E-7's and E-8's carried the primary burden of continuing to power the Zephyr. CB&Q set #9961A,B,C outside of Galesburg, Illinois. 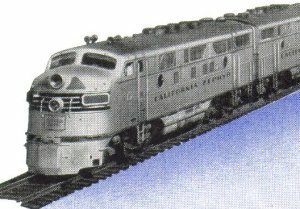 Early CZ literature shows CB&Q colors with California Zephyr lettering, even though this was never actually applied to CB&Q unit's. CB&Q's F3 sets received stainless steel sides, smooth passenger pilots, dual headlights, steam generators and 56:21 gearing. These units wore CB&Q's black nose stripes during their lives as passenger units. E units wore both red or black nose striping during their passenger service. The F3A units received the "A" or "C" suffix in their road number while the F3B units received a "B" suffix. *CB& Q locomotive technical specifications, as listed below for D&RGW and WP units, are not available at this time. If you can help provide any of this information please contact us. During D&RGW's search for Zephyr power, a difference of opinion emerged between D&RGW personnel and EMD. This mainly concerned the method in which EMD was rating available horsepower in their manuals and sales brochures. D&RGW broke with the pack and decided to purchase ALCO's. D&RGW's initial purchase consisted of two A+B+A sets of ALCO PA1/PB1 locomotives. Having made it's point to EMD, D&RGW returned within a year and ordered three A+B+B+A F3 sets. One other aspect that set D&RGW apart from the other two railroads was it's major changes of locomotive paint schemes numerous times during the California Zephyr's existence. This amounted to no less than four different schemes, some lasting less than a year! 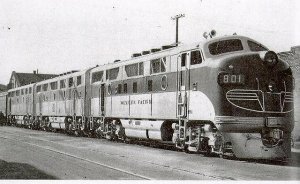 D&RGW would supply one of the largest varieties of motive power to the Zephyr, mostly in the Zephyr's later years. 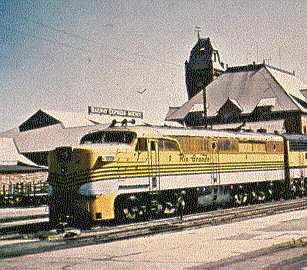 The most common locomotives utilized were the ALCO PA's (occasionally mixed with EMD "B" units), EMD F3's, F7's and F9's. This variety of power would even see freight locomotives being used with a steam generator car within the consist to provide steam. *Note- Seperate weight and tractive effort breakdown for D&RGW F3B's and PB1's not available at this time. If anyone can provide this information please contact us. Both the ALCO PA's and the EMD F3's received dual headlights. The F3's also received passenger gearing and "freight" or standard style pilots. Only B units received steam generators. Neither locomotive types bore stainless steel sides. With the California Zephyr being WP's star attraction, only the best modern power would suffice. Well on it's way to total dieselization by the advent of the CZ, Western Pacific was very familiar with EMD power. With an order placed in August of 1945 for three F3 A+B+B sets, WP spared little in the way of options. 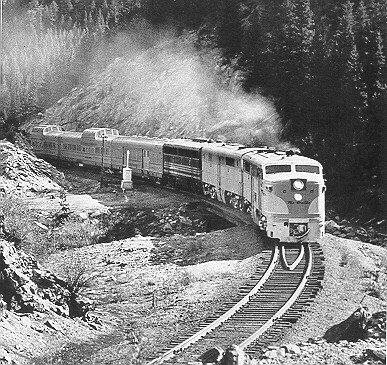 Units were received in June of 1947 and placed into passenger service on WP's other passenger routes until the California Zephyr was ready for operations. WP was to place another order with EMD, early in 1950, for two more sets of locomotives, A+B+A sets of FP7/F7B units. These units would be mixed and matched with the earlier F3 units. Vary rarely did an FP7/F7B/FP7 lashup ever occur after initial delivery. WP is the only one of the three participating railroads which had virtually no changes whatsoever to the overall paint scheme on their passenger locomotives from beginning of Zephyr service to end. Lettering style changes were the most notable exception. Brand new WP F3 A+B+B #801 upon arrival in Oakland. EMD's artwork showing the ordered F3s in the proposed new orange and silver scheme. WP's F3 and FP7 sets received stainless steel sides, "freight" or standard style pilots, dual headlights, steam generators and 57:20 gearing. F3 sets were able to carry 3000 gallons of water for steam generator use. This capacity was increased to 3900 gallons on the FP7 sets. It should be noted that due to WP also purchasing F7B's for freight service, only those equipped with steam generators had a "B" suffix applied to their road numbers. WP locomotives assigned to passenger service received a red and white nose marking, while freight units received two black stripes. One other notable difference between freight and passenger unit paint schemes was the black roof paint. On passenger units the black roof paint terminated just behind the cab doors, usually culminating in a point on the center of the roof (although some were simply terminated straight across the roof). Freight units received black roof paint the length of the engine and down the windshield posts. It should also be noted that engine lettering styles changed during the life of the locomotive's use on the CZ. Both the F3's and the FP7's arrived from EMD bearing the railroad name in the "Zephyr" (or "EMD Gothic") style lettering. 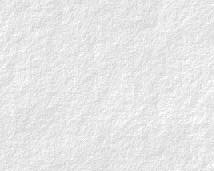 This was later changed by WP to a larger "Clarendon" style lettering.